After wining the Grand Prix at Cannes earlier this year, the reputation of Jacques Audiard’s Un prophète (A Prophet) has, as expected, gone from strength to strength. The film’s continuous rise throughout the year, has seen it take its enviable place at LFF09 as the Sight and Sound Special Screening on the final Saturday of the festival. Son of prolific screenwriter and director Michel Audiard, A Prophet’s writer and director Jacques Audiard also began his career as a screenwriter over 30 years ago, writing for his father’s 1974 film, Bons baisers…à lundi. He made the move to directing in 1994 with Regarde les hommes tomber (See How They Fall) and went on to make another four films in the 15 years before A Prophet, including the critically acclaimed Un héros très discret (A Self-Made Hero) and De battre mon coeur s’est arrete (The Beat That My Heart Skipped). With a solid background in screenwriting, you would expect Audiard’s films to have a strong focus on character and plot and this assumption is confirmed with his latest piece. A Prophet follows Malik, a 19 year old French Arab facing six years in jail with no friends, no-one to turn to and most importantly no-one to protect him. The film tracks the young prisoner’s rise from frightened, intimidated inmate to confident, prison-system player and maybe more importantly, from boy to man. For me, the second transformation was the most interesting in the film as we witness Malik go from an uneducated, socially inept teenager, to a multi-lingual, thoughtful adult. It’s almost as if Audiard’s anti-hero is actually growing in stature on screen, right in front of our eyes. As the film progresses, we see Malik becoming more and more of a product of the system to which he belongs, yet the the more he became involved in these negative activities, the more I began to root for him. You know it’s a good film when you find yourself not only liking, but supporting a murderous, drug-trafficking criminal. A lot of the credit for the character’s depth and credibility within the film has to go to the director’s reportedly actor driven approach. It feels as if Audiard and his cast have taken due care and attention to ensure every nook and cranny of each character’s personality and soul has been explored. 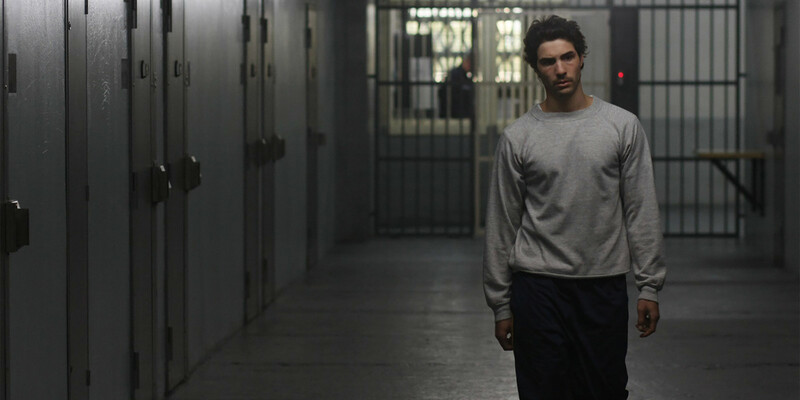 This results in some eye-catching performances from the cast of A Prophet; in particular Tahar Rahim as Malik and Audiard regular Niels Arestrup as Cesar Luciano, are stand out impressive. Corsican gang-boss Luciano’s hair might be receding and his belly fat, but Arestrup still manages to portray him as a pillar of strength and a force to be reckoned with. Malik on the other hand, enters the film physically weak and easily manipulated, but through Rahim’s tour de force performance, his growth throughout the slightly flabby 150 minute duration seems immense. Rahim’s performance shouldn’t be underestimated as Malik’s transformation from young thug to respected leader is completely believable and utterly engrossing. Story-wise, Audiard’s narrative is nothing original, yet he adds enough touches of flair and originality to make this more than just another prison drama, although comparisons are bound to be made with this year’s other French crime movie, Mesrine. Audiard attempts, with varying success, to make his film differ from its competitors with inter-titles, dream-sequences and apparitions and although the narrative is comparable to that of a Hollywood film, the approach is undoubtedly European Art Cinema. As a surprise winner at Cannes this year [MarBelle: It also picked up The Star of London, Best Film award at LFF], I was anticipating big things from A Prophet and maybe it was because of these expectations I left the screening a little disappointed. It’s a well made, well told story and a film definitely worthy of praise, just not the cinematic explosion I’d so desperately craved.